Demonstrators protesting the fatal police shooting of an unarmed black man in Sacramento blocked the entrances to a downtown basketball arena Thursday night amid chants of “black lives matter,” prompting police to shut down admission to a Sacramento Kings game. The Sacramento Bee reported that hundreds of protesters had formed a human chain in front of arena doorways, preventing thousands of fans from entering, and leaving the seats inside the arena nearly empty. “Due to law enforcement being unable to ensure ticketed fans could safely enter the arena, the arena remains closed and we ask fans outside to travel home,” the Kings said in a Thursday-night statement. After the game, the team’s principal owner, Vivek Ranadive, addressed the few fans who had managed to enter the arena before the entrances were closed. He expressed sympathy to Clark’s family and said he recognized the public’s right to protest peacefully. Videos showed protesters outside the arena chanting “Stephon Clark,” the name of the 22-year-old who was killed Sunday by two city police officers responding to a 911 call about a man breaking vehicle windows. The officers fired 20 rounds at Clark, who died in the yard. Police said they thought he had a gun in his hand, but it was actually an iPhone. The protest at the arena Thursday came after crowds blocked commuters on Interstate 5 and some city streets during the height of rush hour. No arrests were made, police said. Video released Wednesday night by the Sacramento Police Department depicts a frantic foot pursuit through darkened streets pierced by white slivers of police flashlights. In the video, Clark is seen running, and the two officers round the corner of the house and find him under a covered patio. Both officers open fire. Sparks from the bullets light up a helicopter’s infrared camera in sharp white pops. The sequence, from the first glimpse of Clark on the patio to the first gunshot, unfolded in about six seconds. Her grandson was short, not 6 feet, she said in a video produced by the Bee. She believes another suspect was smashing windows, and that Clark was in the backyard at the wrong time. The narrative of the Sunday night shooting released by authorities tells a short, grim story. The helicopter observed a suspect picking up a “toolbar” and breaking a window to a house after 9 p.m. Sunday night. The Bee reported it was the sliding glass door belonging to a neighbor. Authorities said the suspect then ran and looked into a car. Police in the helicopter guided officers on the ground to the front yard of Thompson’s house as Clark was coming from the back. They met in the middle, and soon Clark was dead. An analysis by The Washington Post found that 987 people were killed by police last year — 68 of them unarmed. Of those unarmed victims, 30 were white, 20 were black and 13 were Hispanic, showing an overrepresentation of African Americans compared to their percentage of U.S. population. Five of the remaining fatalities were of unknown or other race. At least 230 people have been killed by police this year, according to The Post’s database on fatal force. “I know there could have been another way; he didn’t have to die,” Clark’s brother Stevante told CBS News. 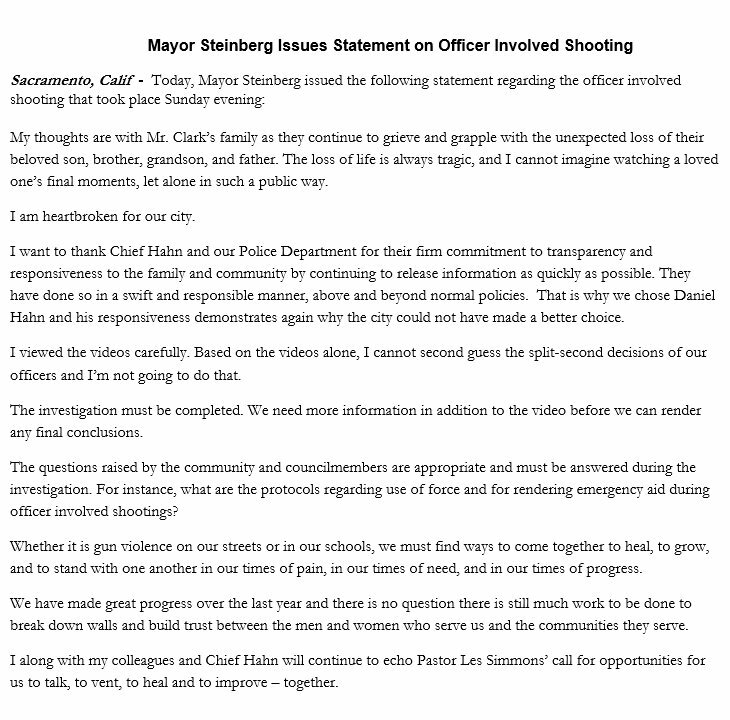 Sacramento Mayor Darrell Steinberg offered his condolences to Clark’s family and said in a statement that he was “heartbroken” for the city. Clark is at least the sixth person shot and killed by the Sacramento Police Department since the beginning of 2015, according to a Post analysis: Five of them were black men; the other was a white man. The October 2015 shooting of Adriene Ludd and the September 2017 shooting of Eric Arnold were the only two of the six fatal Sacramento police shootings in which the person killed was armed with a gun. Police say Ludd fled after a traffic stop and fired at officers before he was killed. Arnold, a suspect in a double homicide, shot two police officers before he was shot and killed. Matt Coates was holding a plastic BB gun when he was shot and killed in May 2015; his girlfriend would later tell reporters that she had told the officers that the gun wasn’t real. In two of the cases — the fatal shootings of Dazion Flenaugh and Joseph Mann — Sacramento police killed people alleged to have been armed with a knife. Clark, it appears, was unarmed. How many times Clark was shot is unknown, authorities said, pending the investigation. The officers are on paid administrative leave as the probe unfolds, officials said. Detective Eddie Macauley of the Sacramento Police said Wednesday he was unsure what model of weapon the officers used, or if the 10 rounds each of them fired represented the entire capacity of their magazines. The police said five minutes passed before responding officers arrived to cuff Clark and render first aid, which ultimately proved futile: He died at the scene. That timeline is not precise, according to the footage. Five minutes and 16 seconds pass between the radio call of shots fired and when officers snap on the cuffs. Several more seconds pass before someone on scene begins chest compressions. Some factors may affect how and if police render aid to someone they shoot, such as if they are resisting or if police think a weapon is present, said Macauley, the police detective. In the video, the officers did not appear to be fearful of an attack once Clark was down. He wasn’t moving, an officer notes. One officer, showing no clear urgency to replenish his ammunition, waits a minute and a half before he reloads. “Sir, can you move?” an arriving officer calls into the night at Clark, minutes after the shooting, telling him they cannot help unless they know he does not have a weapon. Allowing family to see such videos before they are released to the public is part of a city policy adopted in late 2016 by the city of Sacramento after the fatal shooting by police of Joseph Mann, a mentally ill black man. Mann’s shooting led to major changes in the department, including a requirement that all patrol officers wear body cameras. The changes also require police to release videos in “critical incidents” such as officer-involved shootings and deaths in custody within 30 days of the event. Sacramento police Chief Daniel Hahn, the city’s first African American chief, has been releasing videos more quickly than the requirement and for a broader range of events than covered by the new law since taking over the department last summer. Simmons called into question what was left off the released video, particularly at the end. Before the video concludes, the two officers walk to the street, nearly seven minutes after the shooting. Shimmering red and blue lights silhouette an approaching group of officers. Their faces are blurred. “Hey mute?” an officer says. The audio goes silent, and shortly after, the videos end. This post, originally published on March 21, has been updated.